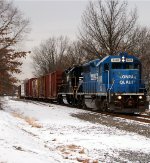 Description: NS 5016 is on the point of H-47 at Alburtis, Pa 2/26/2005. Description: NS L-41 heads back to their train after running around it seen here at the east end of Claypool Siding on the Chicago District. 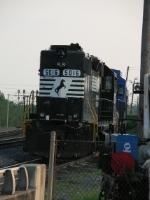 Description: New to the South Jersey pool is NS GP38-2 5016. Fresh paint! Description: GP38-2 NS 5016 is new to the South Jersey pool. Description: CSX 4428, the last CR blue GP40-2 on CSX's roster, leads today's WPCA-51. Description: The CR beauty leads WPCA-51 again today, with fresh snowfall on the ground now. Description: Leading WPCA-51 through Somerdale. Description: Plowing through a small pile of fresh snow at the Somerdale Rd. crossing. Description: The same train passing using a normal lens. Description: I heard a horn, drove to Magnolia, caught NS 5016 and CR 4428 heading south with one car. Description: Power for WPCA-51 at Pavonia.